You may know that heart disease is the leading cause of death for women. Here’s what you may not know: preeclampsia, a pregnancy disorder, puts women at increased risk for heart disease as well as stroke and high blood pressure later in life. Preeclampsia occurs in 5% to 8% of all pregnancies and is characterized by high blood pressure accompanied with protein in the urine or other physical symptoms such as a severe persistent headache and vision changes. Although most women who experience preeclampsia return to normal blood pressure within several months after delivery, preeclampsia survivors are at increased risk for cardiovascular disease after pregnancy and throughout their lives. Cardiovascular disease refers to a variety of health complications related to the heart and blood vessels, including high blood pressure, stroke, and heart disease. You have probably heard cigarette smoking, poor diet, and lack of physical activity referred to as “risk factors” for cardiovascular disease. This means that they contribute to the development of cardiovascular disease. In 2011, the American Heart Association included a history of preeclampsia as a risk factor for cardiovascular disease in its guidelines. Although research is still ongoing, some scientists believe that preeclampsia doesn’t actually cause future cardiovascular disease – rather, the bodily changes of pregnancy unmask a woman’s underlying risk for cardiovascular disease. In that sense, having a history of preeclampsia is similar to having a family history of heart disease or stroke. Other scientists, based on animal studies, suggest that having preeclampsia may cause damage that contributes to increased risk. So, as a preeclampsia survivor, what does this mean for your health immediately and several years after your pregnancy? Hypertension. Studies have shown that preeclampsia survivors have three to four times the risk for hypertension (high blood pressure) compared to women who had normal pregnancies, as early as five years after delivery. Hypertension is defined as a blood pressure greater than 140 over 90 mmHg. Over time, elevated blood pressure can lead to stroke and heart disease. Stroke. Preeclampsia survivors have double the risk of stroke, which occurs when the blood supply to a part of the brain is cut off, preventing that area of the brain from getting the blood and oxygen it needs and leading to damage to that part of the brain. Strokes can cause a variety of long-term problems including paralysis and issues with vision, speech, and memory. Heart disease. Preeclampsia survivors also have two times the risk of coronary heart disease compared to women who had normal pregnancies. Coronary heart disease (used interchangeably with coronary artery disease and ischemic heart disease) refers to conditions in which there is a buildup of plaque in the arteries that supply blood to the heart. This can prevent the heart from getting the blood and oxygen it needs. As a symptom of coronary heart disease, a woman may have angina, or chest pain, due to extra demand for blood and oxygen. A heart attack, or myocardial infarction, may occur if the blood flow to the heart is cut off. Congestive heart failure is a condition where there is a backup of blood from the heart because the heart is not pumping well, often causing swelling in the legs and sometimes buildup of fluid in the lungs, which can interfere with breathing. One recent study found that women with a history of preeclampsia also have about double the risk of cardiomyopathy, a condition in which the heart muscle becomes enlarged, thick, or stiff, hindering its ability to pump blood to the rest of the body, but this condition is very uncommon. An increase in risk for cardiovascular disease doesn’t mean having preeclampsia automatically leads to poor health outcomes. First of all, it’s important to note the difference between relative and absolute risk. The risks mentioned above are what we call relative risk. When we are talking about women who have had preeclampsia, a doubling of risk means women with preeclampsia have twice the rate of disease compared to women without a history of preeclampsia. However, that risk could still be low, especially when women are young. Absolute risk gives you a picture of how great that risk really is, taking into account how common the condition is in the population of women your age. Let’s look at how that works out using this example: about two in 100 (2%) healthy women without a history of preeclampsia will have cardiovascular disease while they’re in their 30s. Having had preeclampsia, your risk relative to a woman of the same age is about double that, bringing your absolute risk of developing these conditions in your 30s to about four in 100 (4%), all else being equal. However, the absolute risk of hypertension, heart disease, and stroke increases as we age – especially after menopause – so women with a history of preeclampsia have an extra reason to adopt a healthy lifestyle. After all, cardiovascular disease is the major cause of illness and death among American women. About one in three American women die of cardiovascular disease. That’s not a risk you want to double! Studies show again and again that women can do a lot to prevent cardiovascular disease and the younger you start the better. There’s no better time to start than now. You can decrease your risk by following the lifestyle recommendations of the American Heart Association. These recommendations include making healthy food choices, exercising, quitting smoking, and practicing stress management to lower your weight and blood pressure. Research is underway to help us understand if there are better ways for preeclampsia survivors to improve their health or lower their risk for cardiovascular disease. Talk to your healthcare provider about your history of preeclampsia and to be monitored for signs of cardiovascular disease. 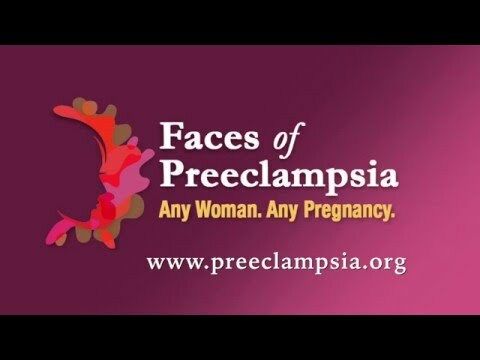 Help to spread awareness in your community about the long-term health consequences of preeclampsia and how you have the power to take control of your heart health! Acknowledgment: Many thanks to Joeli Katz and the Heart Health 4 Moms research team led by Drs. Ellen Seely and Janet Rich-Edwards for writing this article.